The world�s largest automaker, GM, announced a $1.3 billion profit for the second quarter. This beats Wall Street expectations by about $0.12 per share, and is a 48% increase over last year�s results. Much of the profits came from the GMAC finance division, which saw earnings rise $26 million over the same period last year to a total of $860 million. North American automotive operations have improved, however, with earnings totaling $328 million, compared to $83 million last year. GM�s European unit saw its losses widen from $3 million dollars to $45 million. Despite improved financial performance by GM�s North American automotive operations, its collective US marketshare slipped from 27.2 to 26.8 percent. "Overall sales, market share and financial results were well below expectations," said GM Chairman and CEO Rick Wagoner. The financial news out of Ford was similar, with FoMoCo posting a quarter profit of $1.2 billion. Again, their finance division, Ford Motor Credit, posted the bulk of it with an income of $897 million. The news is mixed from the automotive divisions, with Ford of Europe posting a pretax profit of $211 million versus a loss of $525 million last year. The Premier Automotive Group, Ford�s European luxury brands, posted a loss of $362 million despite an 8% rise in sales. Ford blamed much of the loss on unfavorable currency exchange rates and high operational costs at Jaguar. Chairman and CEO Bill Ford Jr. predicted the need for another restructuring effort at the distinguished British make. Courtesy: American Honda Motor Co., Inc. In other news... Honda has announced that it won�t create a separate youth brand, a la Toyota�s Scion. 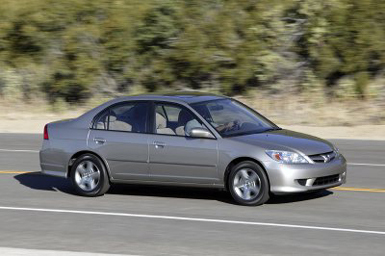 Honda has seen the average age of its buyers increase over the years, though not as dramatic as Toyota�s. As such, they were watching how the public accepted the Scion brand to see if they could make such an operation work for themselves. They will, however, build an entry-level vehicle priced below the Civic in the $12,000 market. According to Automotive News, this new model is expected to be based on a version of the Japanese-market Fit, which was Japan�s best-selling car in 2002. Expect the next generation Civic to move up-market slightly to make room for this new entry.